Chloramine - What Is it? Should You Be Concerned? Most people are aware that their household water supply in treated with chlorine, indeed it’s hard not to be given the effect it has on the smell and the taste of the water. Much has been written about the advantages and the detrimental effects of using chlorine as a water disinfectant. Suffice to say that many people are uncomfortable consuming it everyday and look to home water filtration as a means of removing it, something that can be achieved relatively easily and cheaply with a home drinking water filter. Despite chlorine's effectiveness at killing many of the pathogens which affect human health it does not achieve total success in this goal and some undesirables can manage to survive chlorine treatment, these may include the Legionella bacterium and cryptosporidium cysts. To ensure the destruction of all pathogens in the water supply the water utilities now often add a chemical called chloramine to treat the water, either on its own or in combination with chlorine. Chloramine, an inorganic compound, is a derivative of ammonia where 1,2 or 3 of the hydrogen atoms are replaced by chlorine atoms and form monochloramine, dichloramine and nitrogen trichloride respectively. "monochloramine is about 2,000 and 100,000 times less effective than free chlorine for the inactivation of E. Coli and rotaviruses, respectively." It cannot therefore be considered a complete solution to water disinfection. It is monochloramine, NH2Cl, which is employed as a water disinfectant having has a much lower, but nevertheless still active, tendency than free chlorine to convert organic materials in the water into chlorocarbons such as chloroform and carbon tetrachloride. Such compounds are established carcinogens and in 1979 the Environmental Protection Agency in the USA began regulating their levels in U.S. drinking water. Indeed some of the by products of chloramine use such as iodoacids are even more toxic than those produced by chlorine. Additionally chloramine can increase the amount of lead entering the water when in contact with lead pipes. Of course the water authorities claim that the small amounts of monochloramine used for disinfecting drinking water, what they fail to mention however is that monochloramine is a relatively unstable compound which is able to rapidly change to dichloramine or nitrogen trichloride, pH, temperature and the chlorine ratio all having a effect. All the chloramines are toxic, being respiratory irritants but dichloramine and trichloramine are the most so. “While chloramination produces fewer regulated total halogenated disinfection by-products, it can produce greater concentrations of unregulated iodinated disinfection byproducts and N-nitrosodimethylamine. Both iodinated disinfection by-products and N-nitrosodimethylamine have been shown to be genotoxic. A Belgium study from the Catholic University of Louvain (PDF, 707 KB) shows an increase in asthma with exposure to chloramine from indoor swimming pools and it has also been shown to damage mucous membranes, indeed the lung damage in people exposed to chloramine in indoor pools is similar to that experienced by regular smokers. (see Health24 News article). Chloramine is also extremely toxic to fish, even at very low concentrations.It is estimated that the safe level of Chloramine for fish & other aquatic life is somewhere between 0.002 ppm and 0.005 ppm, generally, chloramine is added to municipal water at about 1ppm. With chlorine its is possible to leave water exposed to the air for an hour or two and much of it will dissipate, this is not the case with chloramine which takes far longer before it reduces in concentration. The long term health effects give rise to serious concern, not just due to what is known about chloramine but also because of the lack of serious studies of its effect on long term human health. Having established that chloramine is not something you want your family, yourself or your pet goldfish to be drinking everyday the question becomes one of how to remove it from your water supply? Chlorine, for all its negatives has one useful property, it is very simple to remove with even a basic water filtration system. Not so with chloramine. The first fact to establish is to find out whether your water supply is treated with chloramine yet, not all are. Your water supply company w is required to supply you with an analysis of your water on request. If you are fortunate enough to be free of chloramine then you need just concern yourself with chlorine removal, which as previously stated, is relatively cheap & easy to do. However, if you are not so lucky then you may need to consider your options for dealing with this contaminant. Chloramine can be removed from the water by the same methods used to remove chlorine. The problem is that chloramines require 3-4 times longer contact period with the filtration media to be effective which means that normal water filters are inadequate for the purpose. Standard undersink water filters will not effectively remove chloramine, although many containing carbon filters will reduce it a little. 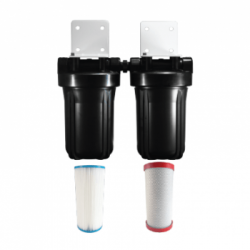 Reverse Osmosis systems will greatly reduce chloramines and if you are looking to install one then you would benefit from choosing one that has at least two carbon filters as part of the system. 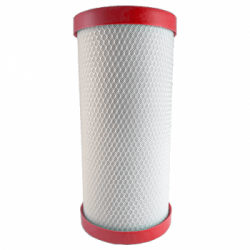 For effective chloramine removal a special grade of carbon filter media known as ‘catalytic carbon’ achieves better results than standard carbon. 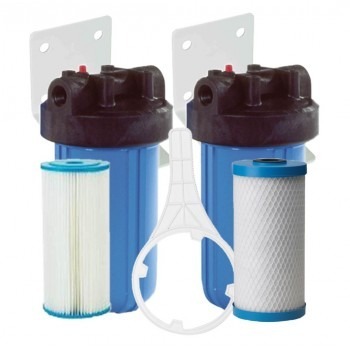 If you have concerns over this chemical in your water or already have an undersink water filter fitted and want to add effective chloramine filtration then your best option may be to install a specialist chloramine filter such as the Osmio Chlorplus Whole House Filter System a twin cartridge system which is designed to remove chloramines and chlorine effectively and filters down to 1 micron. 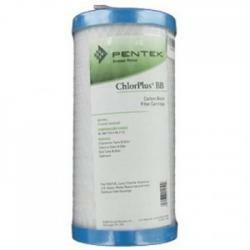 Chloramine Reduction 0.5 Micron Carbon Block 4.5" x 10"